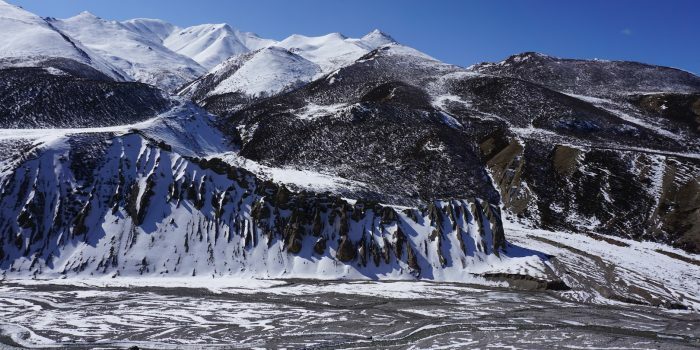 Adventure awaits as we explore the glacier of one of Tibet’s holiest mountains, Amnye Machen, and the headwaters of the Yellow River, China’s second longest river. Here are ways to make your next trip safe and happy and healthy. 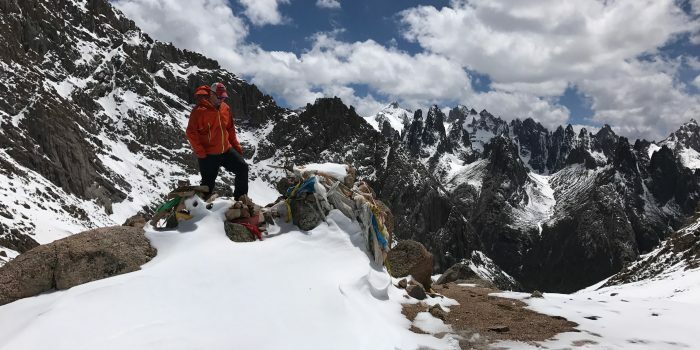 From preventative acclimatization to proper care if you get mild or severe altitude sickness this post will answer a lot of the questions around high altitude sickness. Looking for a great day trip from Xining? 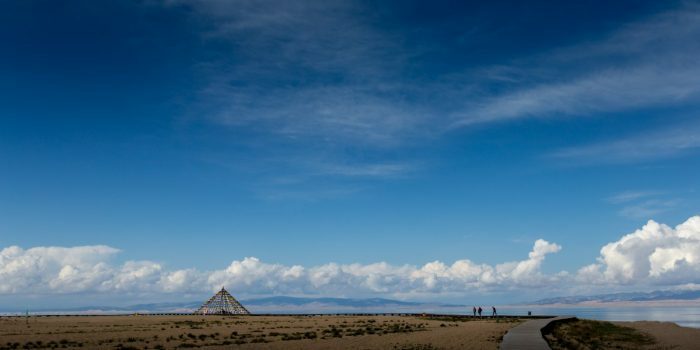 Get away from the crowds and mass tourism of Qinghai Lake and discover a piece of monastic history that few foreigners have ever laid eyes on. Packing for a trip can be stressful. What should I bring? What’s the weather like? How many pairs of underwear do I need? Find out the answers to these questions and more in this blog. Become a pro-packer and feel good about what’s on your back! 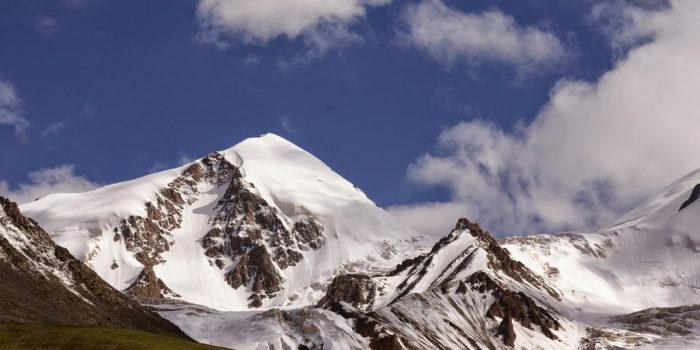 Minya Konka, or Mount GongGa, is the highest peak in Sichuan Province at 7,556 m (24,790 ft). This also gives it the distinction of being the 41st tallest mountain in the world and the easternmost 7,000 meter high (23,000 ft) peak in the world. It is also the the third highest peak outside of the Himalaya/Karakoram range , after Tirich Mir and Kongur Tagh. Trek past fields of Edelweiss and yaks grazing near turquoise glacial lakes and discover the dramatic shark tooth peaks of Nyenbo Yurtse. 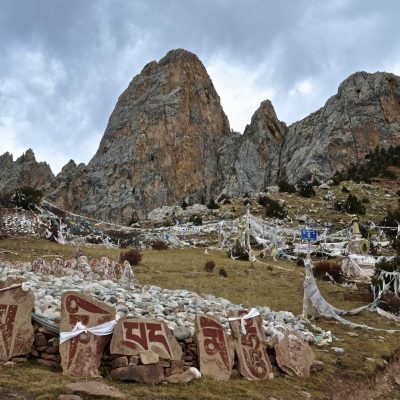 This the home to Tibetan nomads who live at the base of a mountain that hovers at a lofty 5369 meters/17,615 feet. 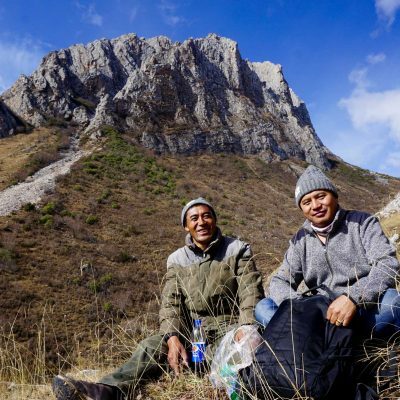 This majestic, holy mountain range is home to over 14 peaks that are over 5,000 meters and is considered the cradle of the Golok Tibetan tribes. 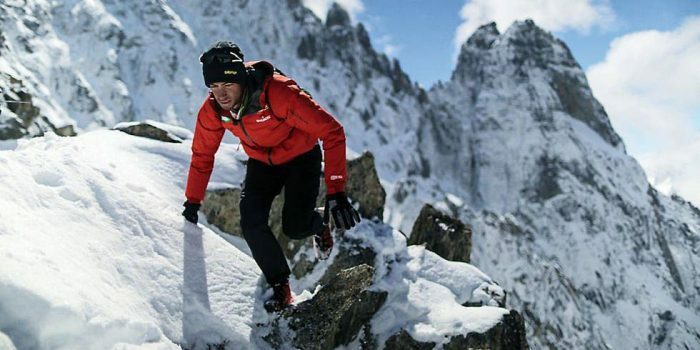 In this post find out how Kilian Jornet set the speed record for ascending Mount Everest on May 21 and 22, 2017. 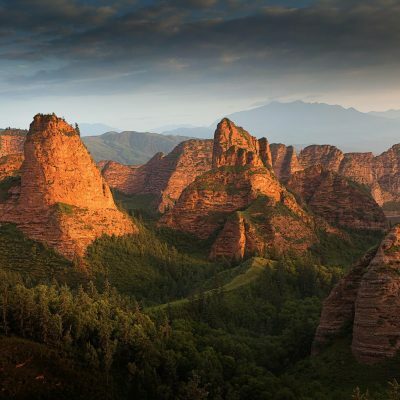 Laji Mountain is just a short 1 hour drive from the center of Xining, China. But getting out into the open spaces feels so remote and free and really can help people learn so much about themselves. Learn about the June 16-18 team building trip we just ran for 30 teenage youth and what it means to seek the wilderness for better learning outcomes and greater team work. Find out what exactly a “DDQ Wild” is. And how these 5 days in the wilderness might just change your life forever. Are you curious what kind of stuff we do at Elevated Trips? 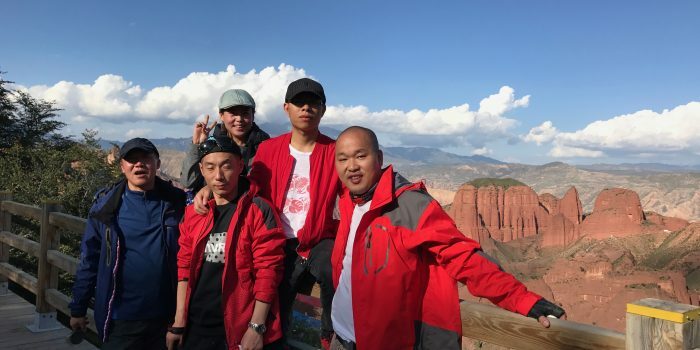 Watch this fun video to get an insight into our most recent 4 night/ 5 day trip to visit red rocks and monasteries. Rebkong (Tibetan རེབ་གོང/ Chinese 同仁 Tongren) is a small Tibetan town that lies 180km south of Xining, the capital of Qinghai Province . Known as Tongren in Chinese 同仁, Rebkong is a small monastic town in Huangnan Prefecture, Qinghai Province, China. Tongren has a slightly unkempt but friendly Tibetan character and is home to both Tibetan Buddhists and Hui Muslims. 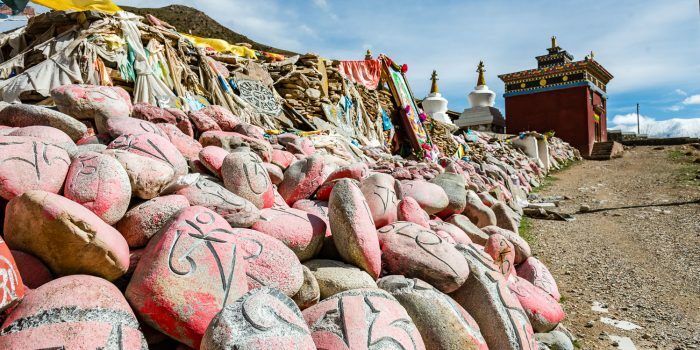 Situated right on the border with the Tibetan Autonomous Region (TAR) , Dege, 德格 in Chinese or in Tibetan སྡེ་དགེ , is the last town in western Sichuan Province before you reach the infinitely large expanse of Chamdo. It is the last major town before the wild (Northern) Sichuan-Tibet highway, G317, leaves Western Sichuan and into Tibet 西藏. 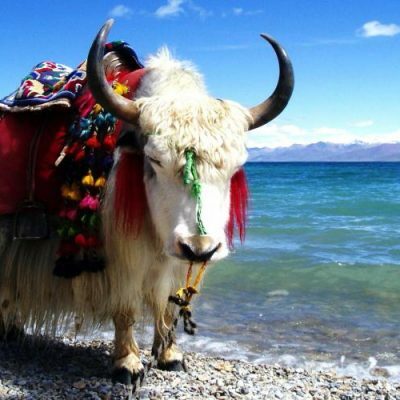 To enter neighboring Chamdo prefecture, Tibet, foreigner travelers will require special permits. 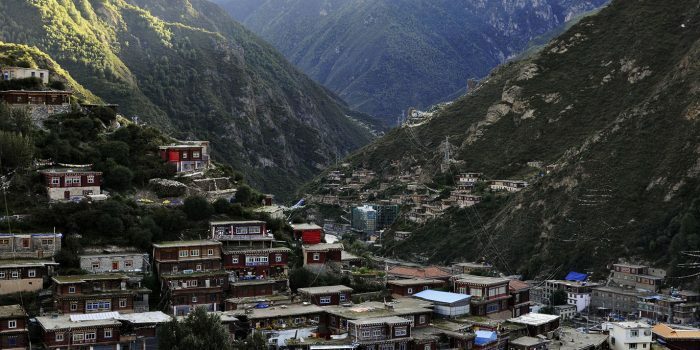 At an altitude of 2600m (8,530 ft) Kangding, known as Dartsendo Tibetan དར་རྩེ་མདོ་, is by far one of the most charming towns in all of Tibet. Kangding is located in a valley of the Tibetan Plateau about 210 kilometres (130 mi) west-southwest of Chengdu, the provincial capital, and 100 kilometres (62 mi) west of Ya’an. 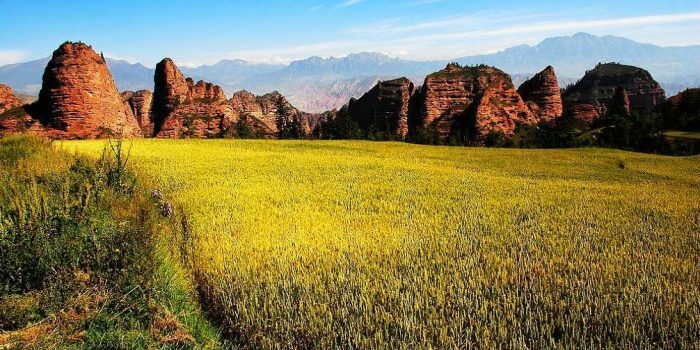 In 1991 a famous love song was written about Kangding and its surrounding mountains and it is easy to see why such an idyllic place would have such a huge romantic, folksy appeal. 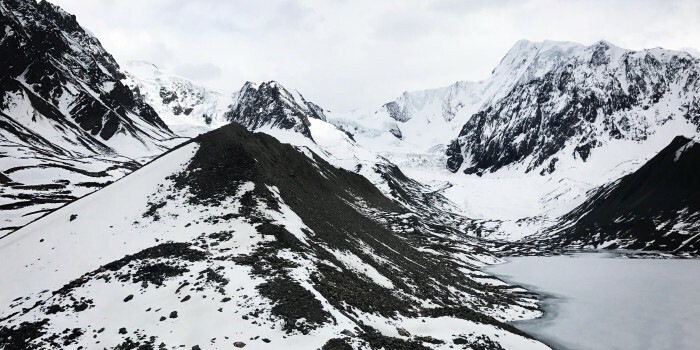 Like Dege, it is sandwiched in between snow mountains and runs as a parallel strip along a river in Western Sichuan Province. Stand on the corner of the monastery pilgrimage and allow the smells of burnt juniper and grain offerings to fill your nose. Listen to the creaking of spinning prayer wheels and bells tinkling in the wind as you enter Labrang monastery. 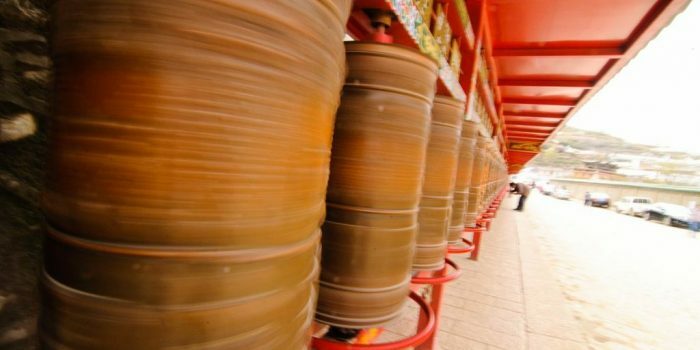 Here, as you amble around the world’s longest stretch of prayer wheels along a 3.5km long path around the monastery perimeter, you will encounter Tibetan pilgrims who have come to Labrang Monastery to pray for their friends and family. 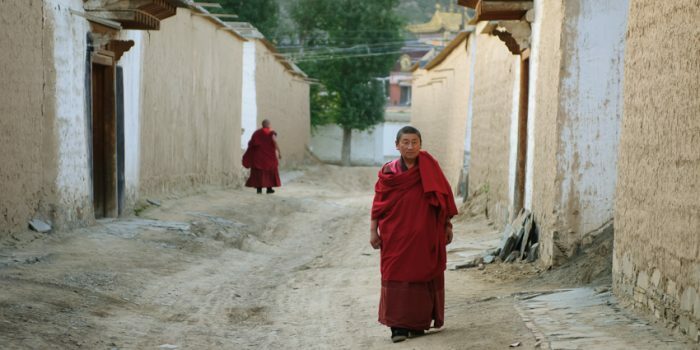 The monastery, with 1,600 monks, 18 temple halls, and six separate institutes of learning is a small city in and of itself and dominates the western part of Labrang town. The white walls and gilded roofs and endless alleys offer limitless opportunities to glimpse monastic life in action. In the backpacking and mountaineering world of the Western United States, a “fourteener” is a mountain summit with an elevation of at least 14,000 feet (4267 meters). 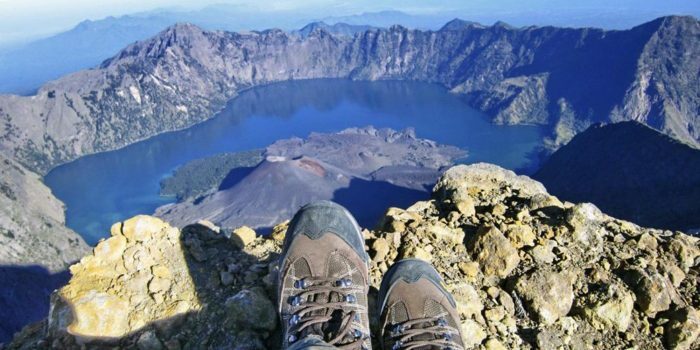 There are 96 fourteeners in the United States, all of these west of the Mississippi River. 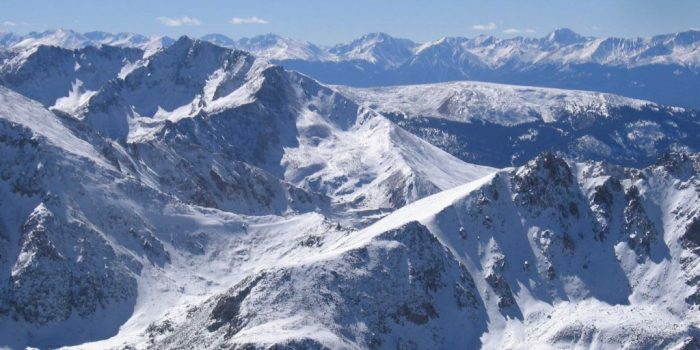 Colorado has the most (53) of any single state, while Alaska has 29 such peaks, California has 12, and Washington State has 2 of these impressive peaks over 14,000 feet. 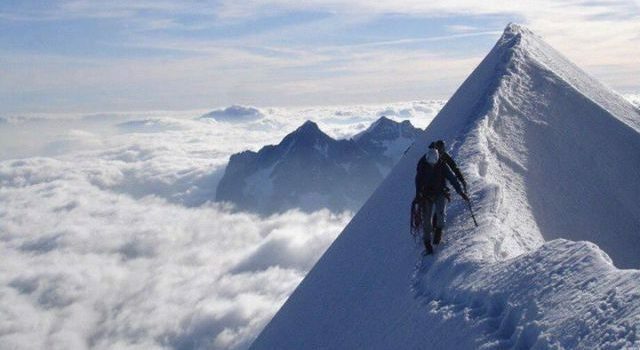 Many hikers and climbers try to climb or ski all the fourteeners in the 48 continental United States, one particular state or region at a time, and this is considered a very significant accomplishment in extreme, high altitude environments. 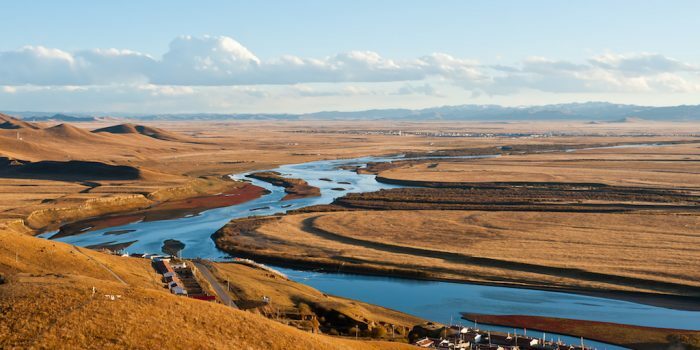 Located just 5 hours south of Xining, Xinghai 兴海 is a small Tibetan town south of Qinghai Lake. Xinghai is located in Hainan Tibetan Autonomous Prefecture, an area that is in the northeastern part of Qinghai Province and is just south of the Tibetan town of Chapcha (Gonghe 共和 in Chinese).There is now a new highway (G214) running from Xining 西宁 to Yushu 玉树 (through Gonghe) and this once 15-25 hour grueling drive is now getting more accessible and is only 11 hours. This is truly a stunning overland drive through very high, extreme grasslands and pure nomad culture. 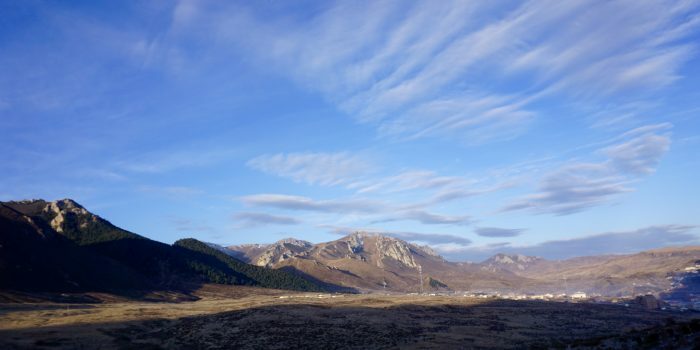 Since the April 2010 earthquake, Yushu has been rebuilt with beautiful infrastructure that supports tourism with a modern but distinctly Tibetan flair. 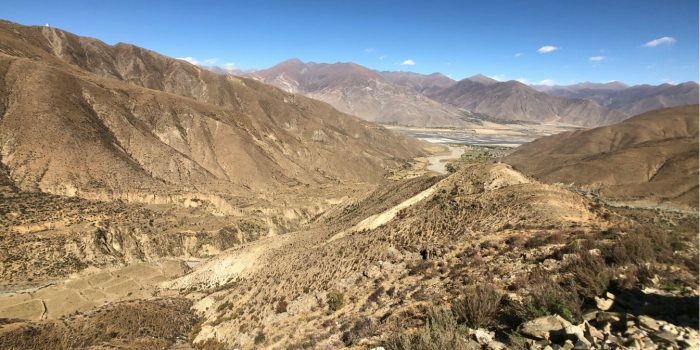 The newly reconstructed Yushu offers to be an excellent base for adventures in hiking and exploring the variety of monasteries and religious activity in Kham Tibet. 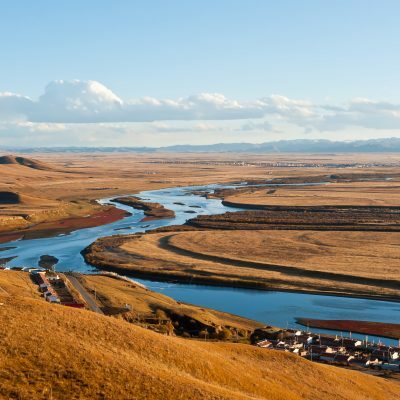 Yushu (玉树; Yùshù; also known as Gyêgu, “Gyêgudo”, “Jyekundo” or “Jiegu”) is a town in Qinghai Province located on high rolling grasslands at 3,700 metres (12,100 ft). 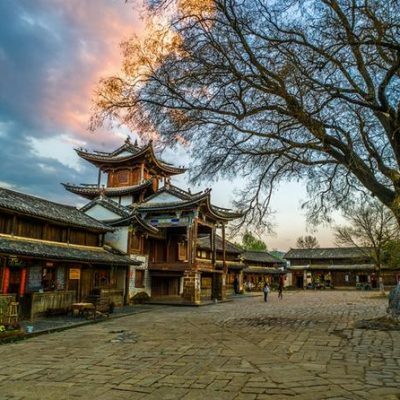 Home to more than 14 million people and roughly the size of Los Angeles, California, Chengdu has the reputation of being a very “laid-back” city for its extraordinary size. 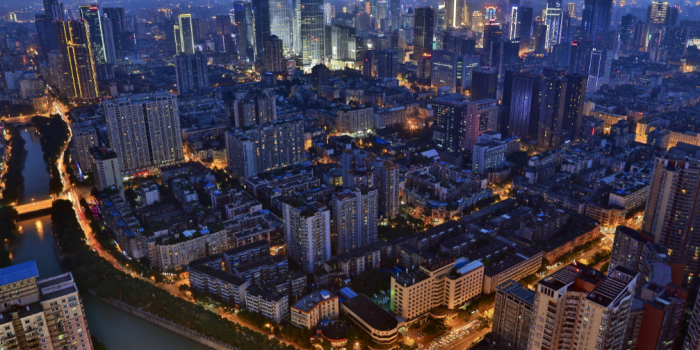 While Beijing may be the home of national government and the historical Hutongs and Shanghai is China’s economic center, Chengdu is one of China’s most livable mega-cities with a great deal of well-planned green space and parks, a vibrant nightlife, and many new western style buildings. A correctly organized backpack will make your hike even more comfortable. 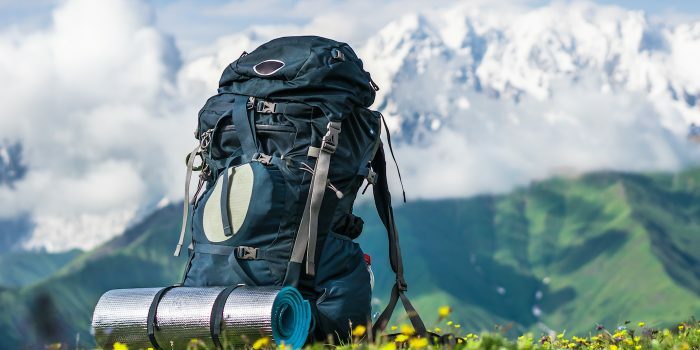 Regardless of how in shape you might be, incorrectly packing a backpack can quickly lead to overexertion on even the simplest of hikes. Here are a few tips to make your backpack as comfortable as possible. Keep in mind, however, this is a general guideline. 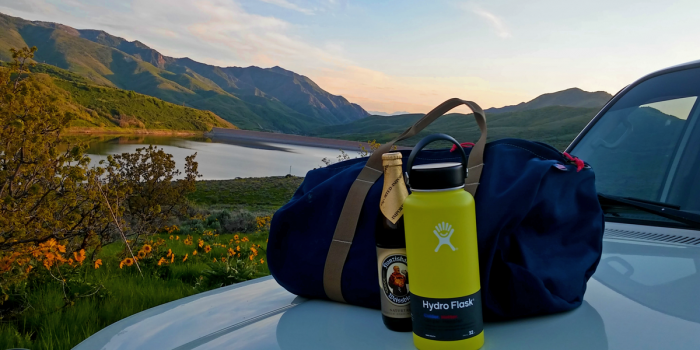 You may have to tweak these tips a little bit depending on what gear you decide to bring on a hike. It’s amazing how a little ink can provoke so much thought. Writing can stir us to war or peace. It can make us pause in a fast-paced digital age and reflect on what is really important. Here are 25 quotes to help you get you out of the rush and into the woods! Dawu or 大武镇 (in Tibetan known as Maqen) is the capital of Golok, also sometimes spelled “Golog”. 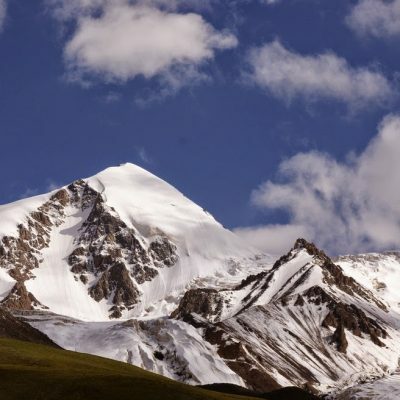 Golok is the highest area in Amdo Tibet, with most of it lying above 3,962 meters /13,000 feet in elevation. It is a beautiful, remote region resting on a high plateau in Qinghai Province, and is known for its wild, nomadic culture. The population of about 140,000 people is dispersed across 75,000 square kilometers, an area roughly the size of Austria. With temperatures at an average low in January of negative 21.4 C and an average low in July of positive 4.6 C you can bet your wooly winter socks that this place is a chilly mountainscape where winter weather can hit at any time of the year. But for the rugged adventure seeker this is the gateway to paradise. The Yellow River has its source and flows throughout Golok, creating dramatic canyons and pastoral floodplains all throughout the Golok region. 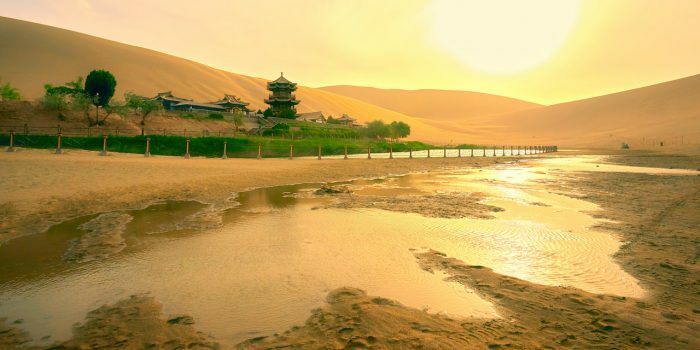 The Yellow River is the 7th longest river in the world, flowing from the headwaters near Maduo through the foot of the Annye Machen mountain range all the way down to Bonhai Bay in Northeastern China – a total of 3,398 miles. And it all starts at 4,500 meters high in the plateau in Golok. Qutan Monastery is an excellent day trip from Xining, the capital of Qinghai Province. 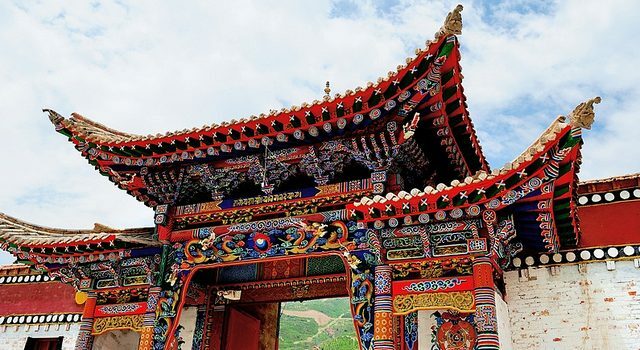 With original stone and wood architecture that is 626 years old and original hand painted Thangkas that are over 600 years old, it is hard to find many other such well preserved Tibetan Buddhist monasteries in all of western China. 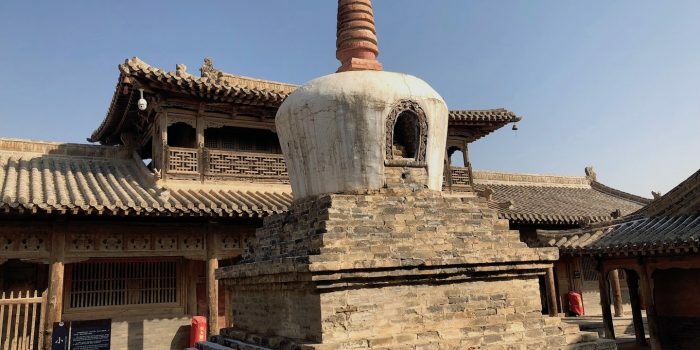 While most monasteries were destroyed and leveled during the Cultural Revolution, this monastery stayed intact despite the times of upheaval and reform because of its history being funded by the Chinese emperor. Thus, this is a rare gem that is certainly worth an afternoon trip! 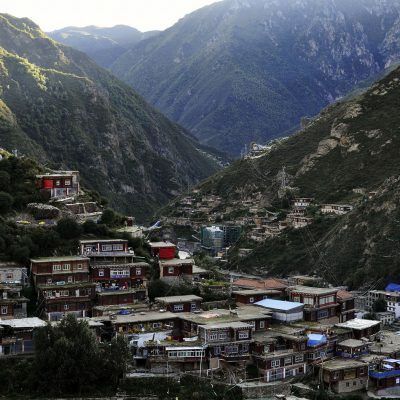 Danba 丹巴 is a small mountainous Tibetan town in a narrow valley in Ganzi Autonomous Prefecture in western Sichuan Province that is located 450km west of the city of Chengdu. It takes about 7-8 hours to reach Danba via public bus from Chengdu, the capital of Sichuan Province. The county is not far from Ya’an in the southeast, Kangding in the south, and Daofu in the west. 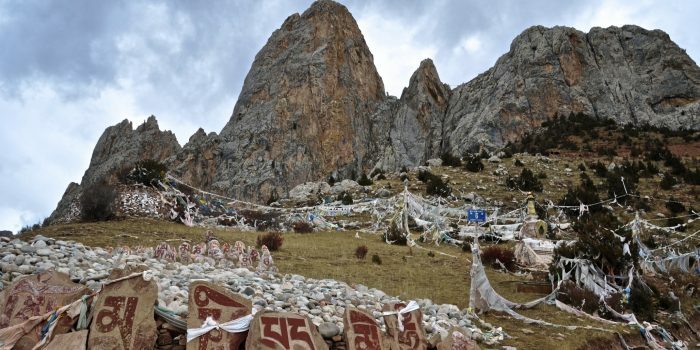 But this valley has a unique treasure that no other place in all of the Tibetan Plateau has: the mammoth stone towers that are something straight out of the lore of Tolkien’s “Lord of the Rings”. Danba is named “kingdom of one thousand watchtowers” and it doesn’t take long to see why. These massive towers and citadels, now scattered across the productive farmland, were built hundreds of years ago for defensive purposes and for passing messages between different villages. The height of these hand built stone military structures is generally above 30 meters, while the tallest tower measures exactly 60 meters. 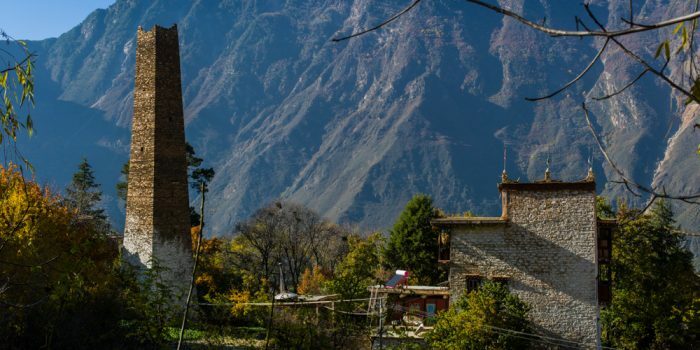 To see these towers hovering over the lush agricultural Danba Valley like long-forgotten medieval masterpieces is a truly unique Sichuan Tibetan experience. With an average elevation exceeding 4,500 metres (14,800 ft), the Tibetan Plateau is sometimes called “the Roof of the World” because it stands over 3 miles (4.8 km) above sea level and is surrounded by imposing mountain ranges that harbor the world’s two highest summits, Mount Everest and K2, and is the world’s highest and largest plateau. 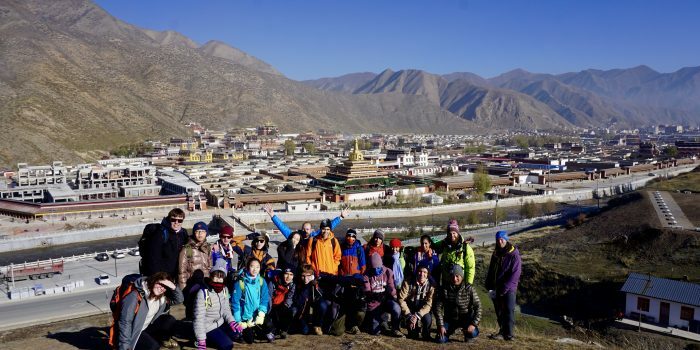 Acclimatization is one of the most important things when you are traveling to the Tibetan Plateau. 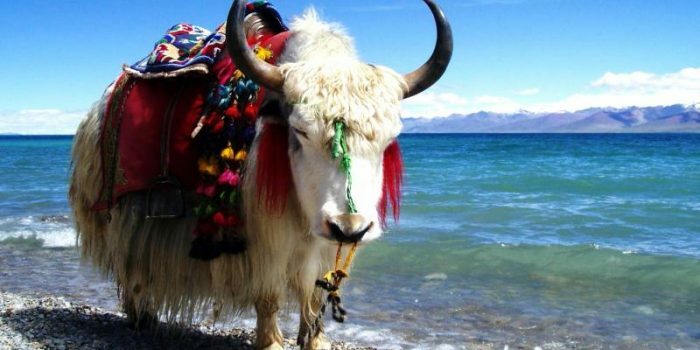 As most of the destinations and attractions of the Tibetan Plateau, including Langmusi, Qinghai Lake, Maduo, and Yushu are at high altitudes above 10, 000 feet, tourists and other visitors might suffer from headaches, dizziness, and Acute Mountain Sickness or AMS. 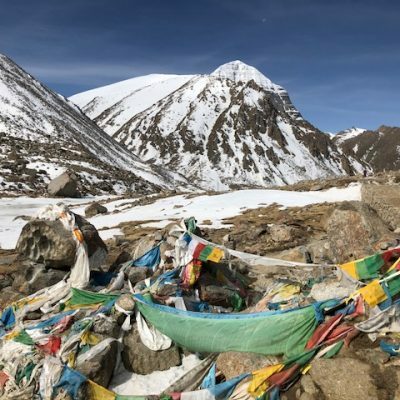 Thus, a little planning for acclimatization to the high altitudes of Tibet surely becomes one of the most important things to do before and during your Tibet tour. 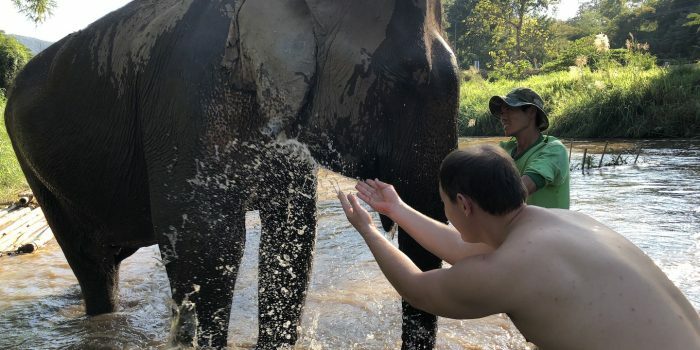 What is the deal with riding and washing elephants in Thailand? From intricately designed temples to one of Thailand’s most famous beers, elephants in Thailand certainly have quite the reputation. 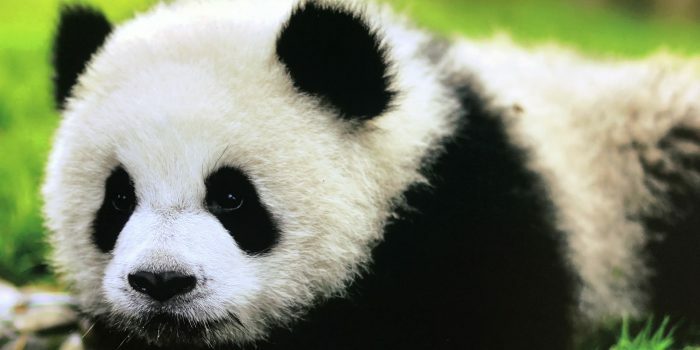 But what can we do to promote ethical tourism and ethical treatment of these beautiful, iconic animals? Elevated Trips recently just ran a 10 day journey into the heart of the Thai jungle to explore and walk beside these incredible creatures. Find out where and how we recommend interacting with the Thai elephant for the best possible sustainable environmental practice. 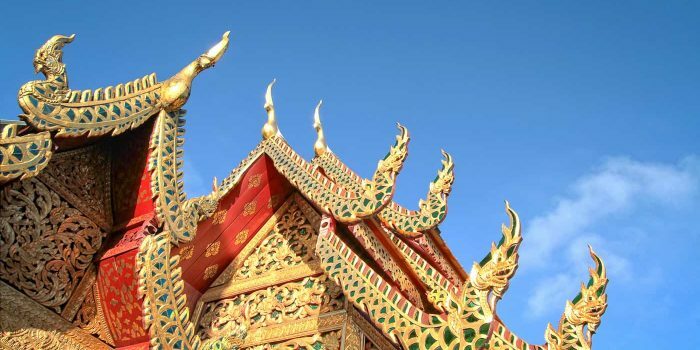 Thai hospitality is an art perfected in Chiang Mai, and recent decades have seen the city emerge as one of Asia’s most popular, best value destinations. 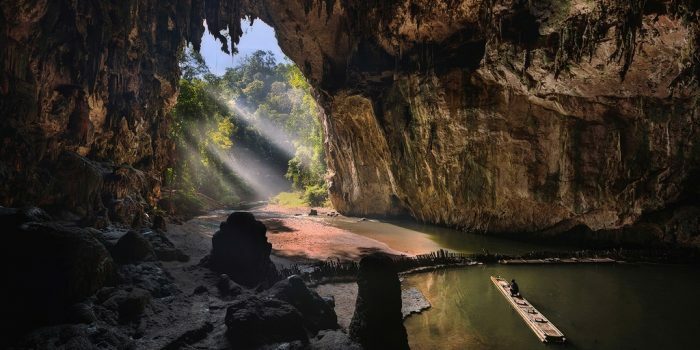 People come to experience the beautiful mountainous scenery of Northern Thailand, go trekking, eat, drink, party, delve into history, and seek out adventure. The quiet winding lanes of the old town, rustic old wooden guesthouses, lively riverside restaurants, colorful hill tribe folk, nearby elephant camps, and the bustling Night Bazaar all contribute to make Chiang Mai an unforgettable destination. One of the best parts of traveling is that it allows you the opportunity to taste new and diverse foods. Here is a blog for the inner FOODIE in all of us! 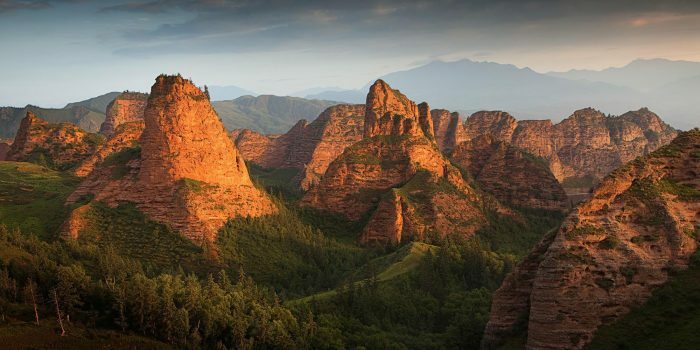 A good deal of the Tibetan Plateau is found in the west of Sichuan Province. 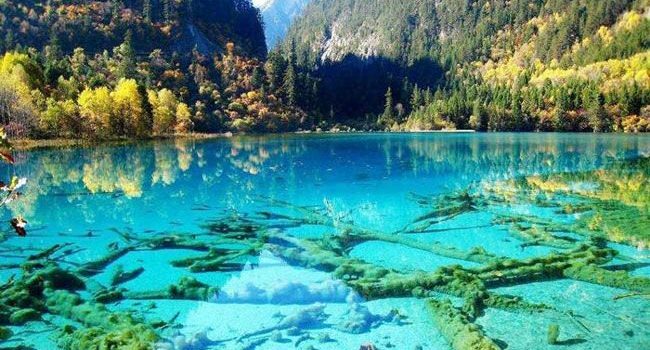 So many travelers find themselves starting in Chengdu or Kangding to explore western Sichuan. 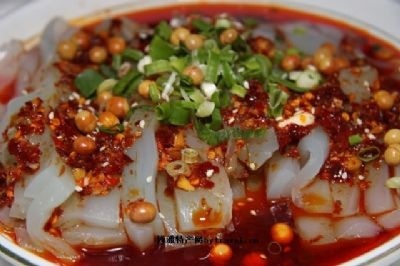 So we figured we would spice up our blog and help you navigate the Sichuan food scene like a pro! I love roaming the streets and eating street food! Ladakh, India is an area in the north-east region the Himalayas that borders with Pakistan and China. Being surrounded by the world’s highest mountain ranges, the Karakoram Range and the Himalayas, Ladakh is very isolated from the rest of the world. Ladakh is well known by all sorts of international travelers for its extreme deserts, blue waters, freezing temperatures, glaciers, and sand dunes. From 6,000 meter peaks to ancient fortresses, there is something breathtaking and other-worldly around every corner. From January 31 to February 6, 2018 we visited Ladakh in their low tourist season and got to experience the highest motorable road in the world, a trek across the frozen rivers of the Chadar River, and Ladakhi hospitality in its purest form. In this blog we will share our journey traveling for 7 days across this barren, beautiful, mysterious land. We hope our travel blog inspires your own journeys of mystery and discovery. Meet Ms. Qi, a 73-year-old Chinese backpacker who has probably visited more epic places than anyone from her younger generation. Qi has already visited the United States, as well as many countries throughout Europe and Asia, and she does all of her traveling solo. She travels on a budget by carpooling and couch-surfing and saves money by staying in cheap dorm rooms in youth hostels (often otherwise filled with 22 year old travelers). Ms. Qi keeps in touch with her 92-year old mother (and all her many fans) via social media. And according to Pear Video she has absolutely mastered the art of blogging and social media. Get inspired by Ms. Qi for your own world travels! 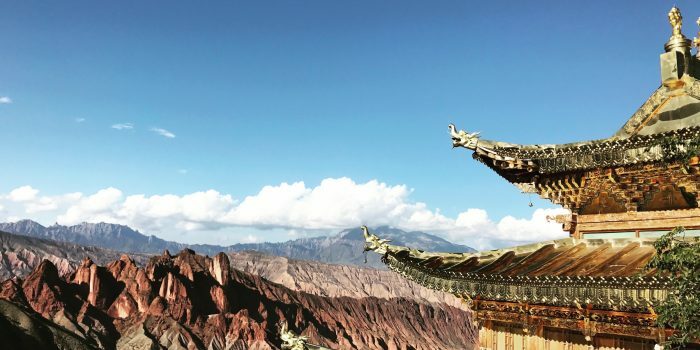 Discover one of western China’s off the beaten path destinations and come explore Qinghai Province for clean air, open skies, and unclimbed mountains as far as the eye can see. By area, Qinghai is the largest province in the People’s Republic of China (excluding the autonomous regions). 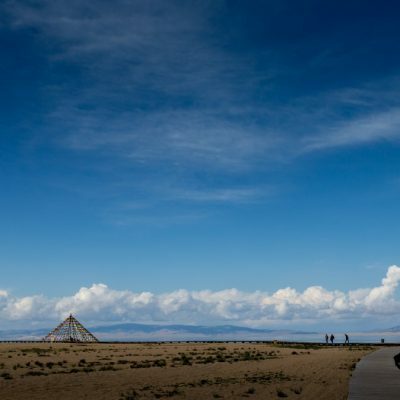 Qinghai is most famous for the turquoise brilliant waters of Qinghai Lake, the largest salt water lake in China and the 2nd largest salt water lake in the word, at 3,200 meters in elevation. But there is so much more to Qinghai than just its namesake lake. The Qaidam basin lies in the northwest part of the province. About a third of this resource rich basin is high altitude desert. The basin has an altitude between 3000 and 3500 meters. Qinghai is located on the northeastern part of the Tibetan Plateau and is often called “the water tower of China”. The Yellow River originates in the southern part of the province, while the Yangtze and Mekong have their sources in the southwestern part. 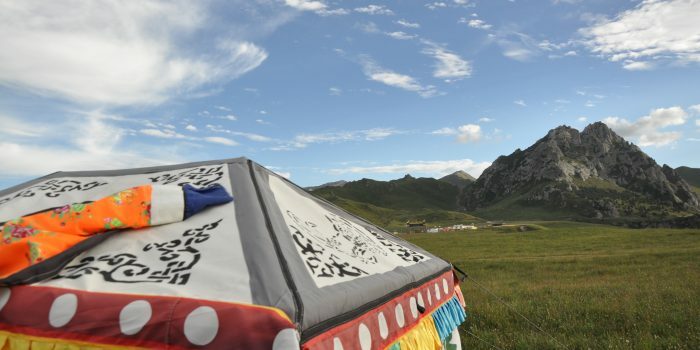 Qinghai offers diverse cultures from nomads in pastoral lands to farmers in lower lying agricultural zones. The path around Mount Kailash is 52 km (32 mi) long. 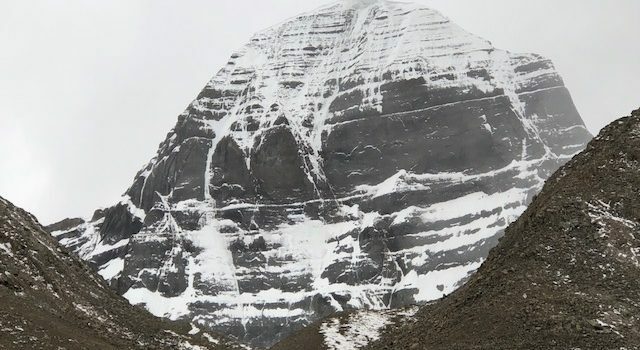 Some pilgrims believe that the entire walk around Kailash should be made in a single day, which is especially difficult given the cold and high altitude. A Tibetan who is in good shape and is walking fast would take perhaps 15 hours to complete the entire trek. Still other religious devotees prostrate around the mountain, bowing on the ground with every step. 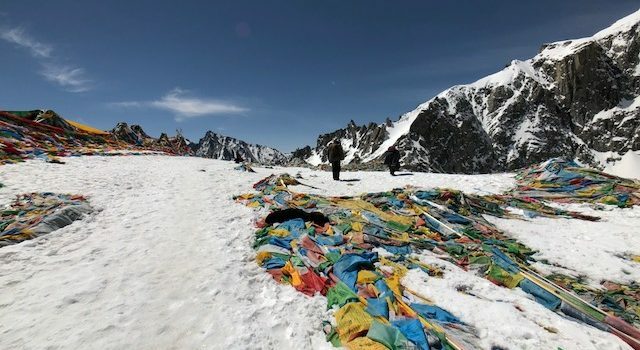 At this rate, pilgrims take a minimum of 16 days to complete the entire circuit around the mountain, often carrying their own blankets and tents to sleep on the trail along the way. 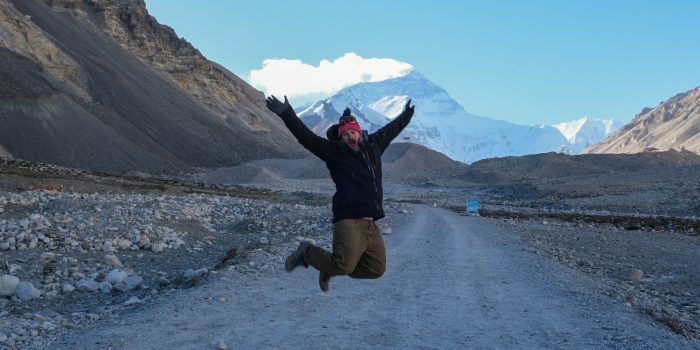 Here is what you really need (and what you don’t) when you are packing for your trip to Mount Kailash! Lhasa (Chinese Name: 拉萨 (lā sà) is the capital and largest city in Tibet. 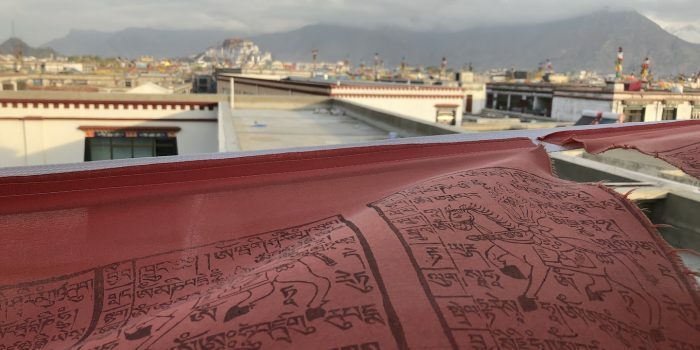 Founded in the 5th century and largely closed to foreigners until the early 1980s, it is a holy Buddhist city dominated by the Potala Palace, and full of prayer wheels and prayer flags and Tibetan pilgrims who have come from 1,000’s of miles to worship at the “Mecca” of Tibet. 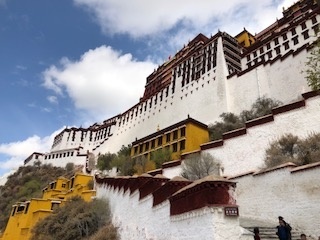 The Potala Palace (on the north side of Lhasa, Tibet) is the massive fortress-like building that is often depicted in the classic photographs of Lhasa. With over 1000 rooms and at 14 stories tall this is considered the essential building of Tibetan architecture. 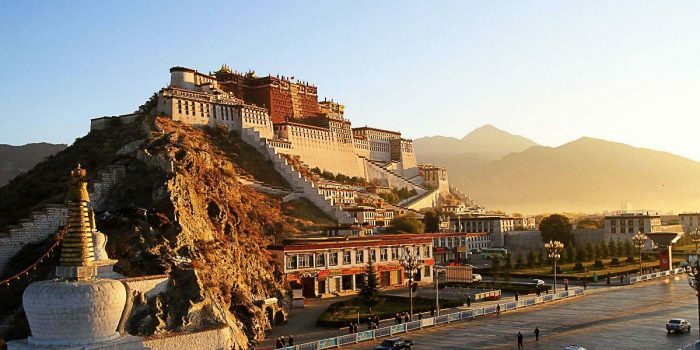 The palace is a massive white and brownish-red structure that casts an imposing shadow over the rest of the Lhasa and is held sacred in many Tibetan paintings, weavings, and sculptures in homes, monasteries, and restaurants all across the Tibetan Plateau. 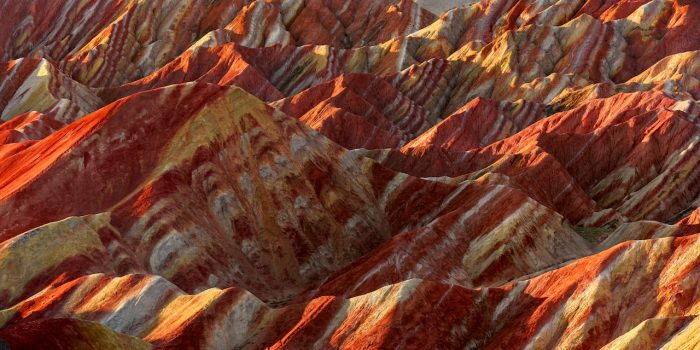 From the legendary Horse Hoof Temple (Mati Si) to the striking colors of the Rainbow Mountains, Zhangye is a small town on the Hexi Corridor of the Silk Road that presents some of the most unique, awe inspiring desertscapes of western China. 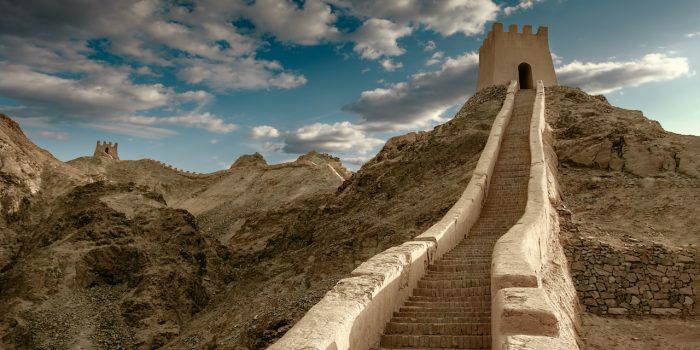 This is a must visit destination for those looking to explore the 2000 year old history and culture of the Silk Road. Kanbula National Park is like a mini Grand Canyon with soaring Red Rock Cliffs and perfect hikes winding through the canyon walls overlooking the Yellow River! 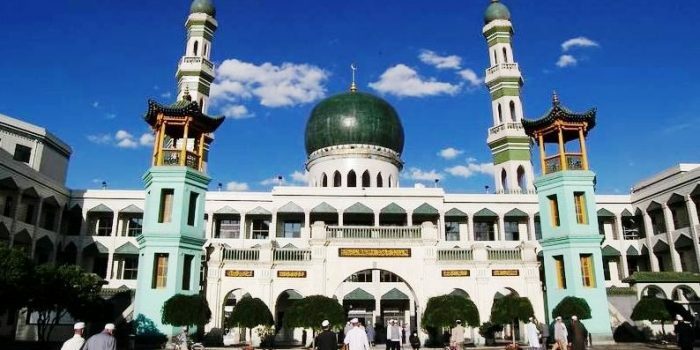 Most people do not realize that there are over 20 million Muslims in western China. 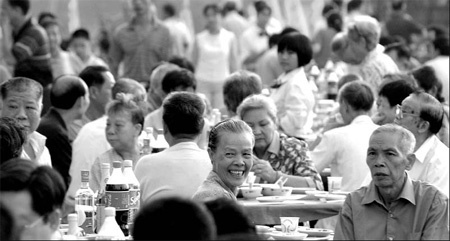 Of the 56 recognized ethnicities in China, 10 of these are predominantly Muslim. This contributes greatly to the diversity of western China as a crossroads of culture, food, and language. Here is a quick view of #Islam in western #China. Situated on the Pakistan-China border, K2 is the highest peak of the Karakoram range and the 2nd highest mountain in the world. 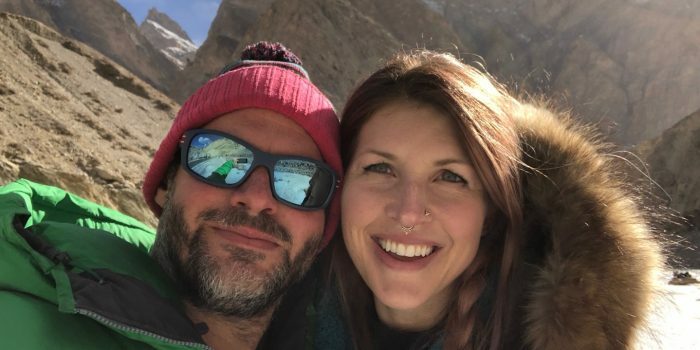 If you are a mountain lover and love climbing them then here’s a story that will blow your mind. 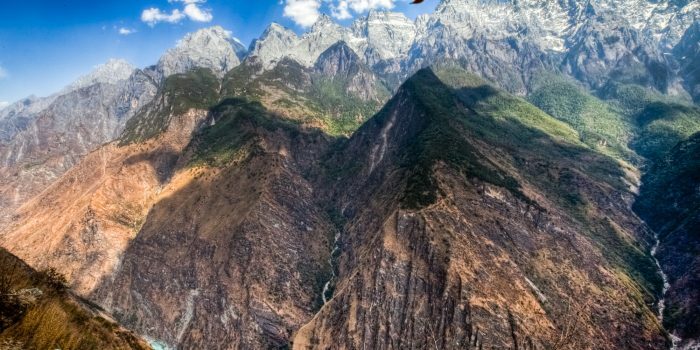 The Tiger Leaping Gorge trek (虎跳峡; Pinyin: Hu Tiao Xia), near Lijiang in Yunnan, is one of the finest treks through some of the most naturally beautiful and diverse landscapes China has to offer. The trail runs high on the northern side of the gorge passing through quiet villages, shady forest, steep dropoffs, and lush terraced farmland. 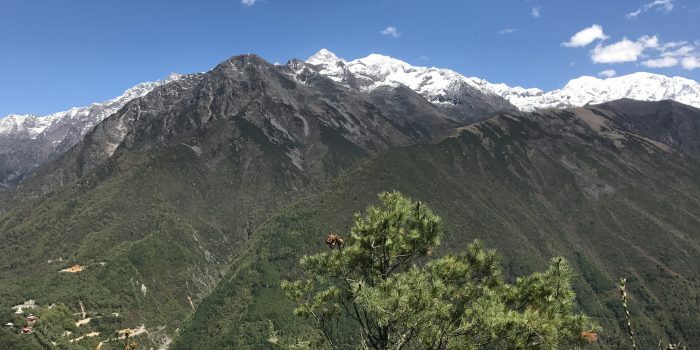 The snow covered peaks of Jade Dragon Snow Mountain (玉龙雪山; YuLong XueShan; 5596m) and Haba Snow Mountain (哈巴雪山; Haba Xueshan, 5396m) shadow either side of the gorge. 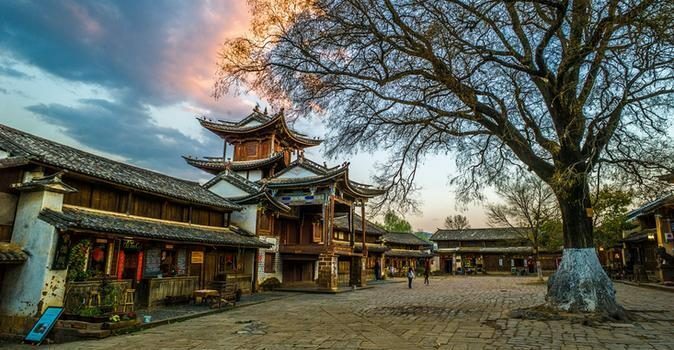 Once a major stop on the former Tea Horse Road, Lijiang is teeming with beautiful landscapes, deep history, and rich Naxi culture. 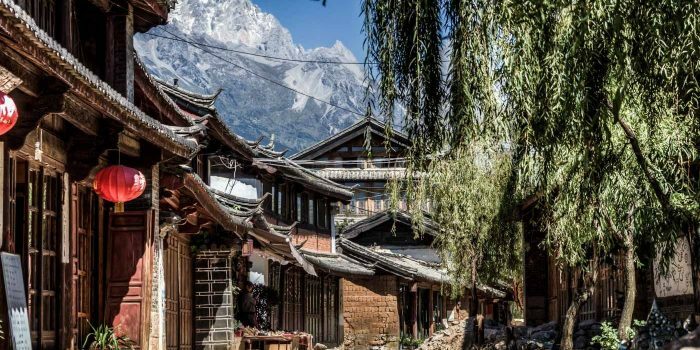 Most adventures in Yunnan Province begin with an exciting walk through the narrow streets and winding canals of Shuhe Old Town in Lijiang. 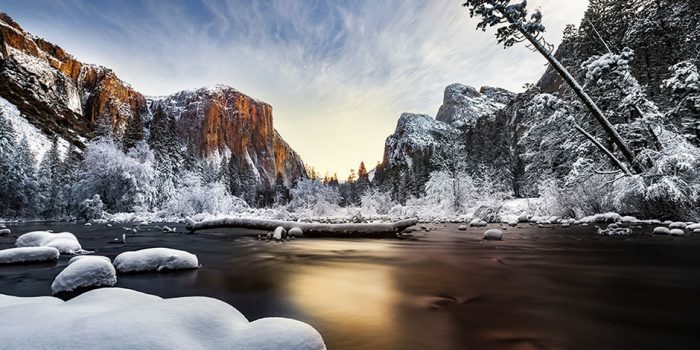 This place is the very definition of romantic. Shangrila (香格里拉; Xiānggélǐlā; formerly Zhongdian 中甸 in Chinese, known as Gyalthang in Tibetan) is in northern Yunnan Province. Be aware that a big part of the historic wooden “old town” burnt down on January 11, 2014 and this is now in the process of being reconstructed. So expect a classic town but one in transition. Many of the previous establishments in the old town have been relocated, rebuilt, or completely replaced. Hezuo is a town in Gansu Province. 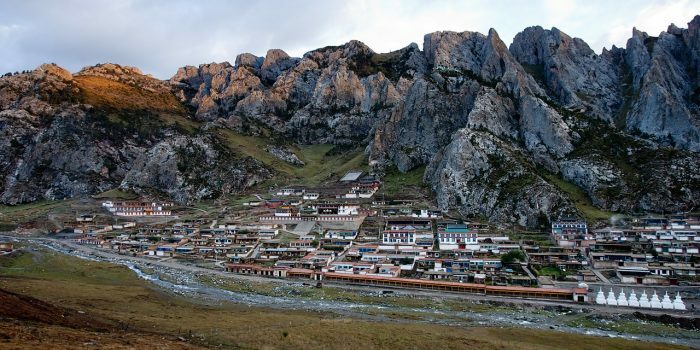 It is also the capital of Gannan Tibetan Autonomous Prefecture. 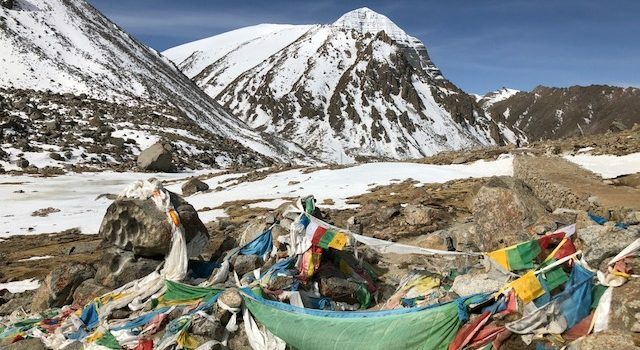 It is known as a gateway into the high grasslands of both Labrang and Langmusi and has an amazing 9-story Buddhist temple that tells the story of one of it’s greatest saints and heros, Milarepa. 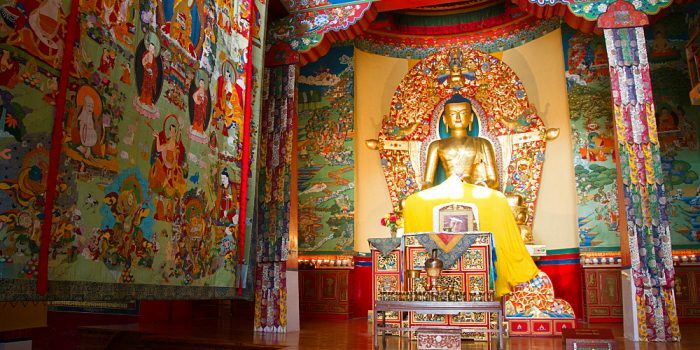 Find out what the inside of a monastery is really like. Xining is the capital of Qinghai Province and is the launching point of many of our tours into the high plateau. 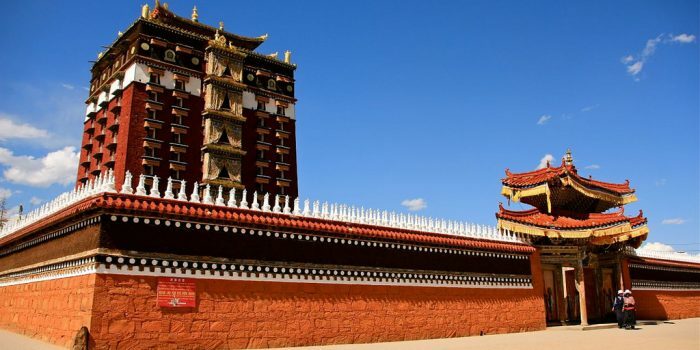 Xining is an interesting crossroads representing a mix Tibetan Buddhism, Islam, Daoism, and Chinese Atheism. Few other places in the world could hold so many religions and cultures as Xining does. 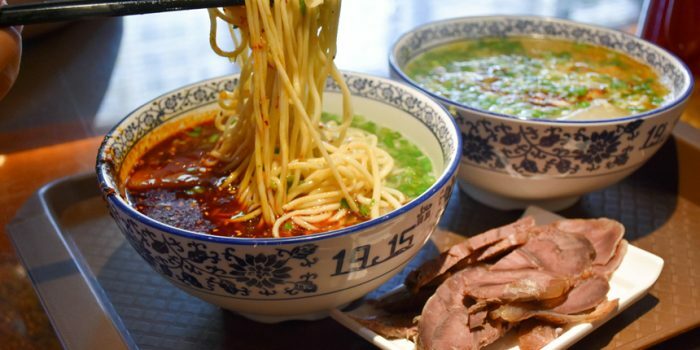 As a place of trade along the Silk Road, Xining is a melting pot of cultures and every corner yields a new discovery for both foodies and backpackers alike. 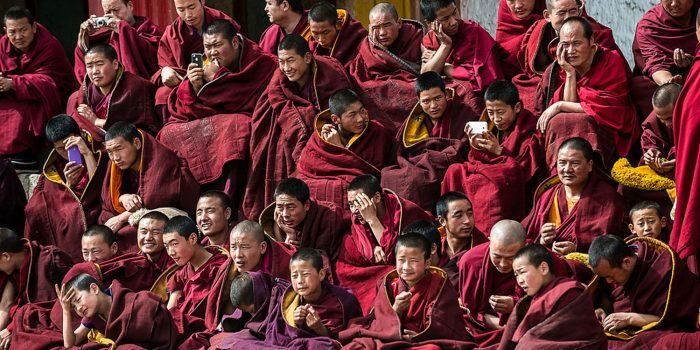 Whether you want to see Hui Muslims worshiping on colorful carpets to an Arabic call to prayer or Tibetans chanting mantras and spinning prayer wheels, this is a lively hub of activity and culture that is sure to be a great start (or finish) for your own journey into the west. 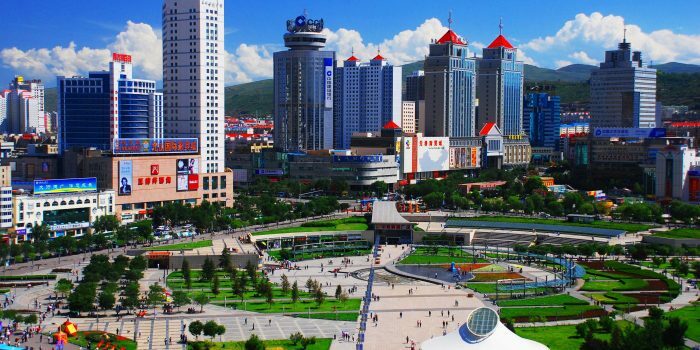 Lanzhou is a city of 4 million people and is the capital of Gansu Province. 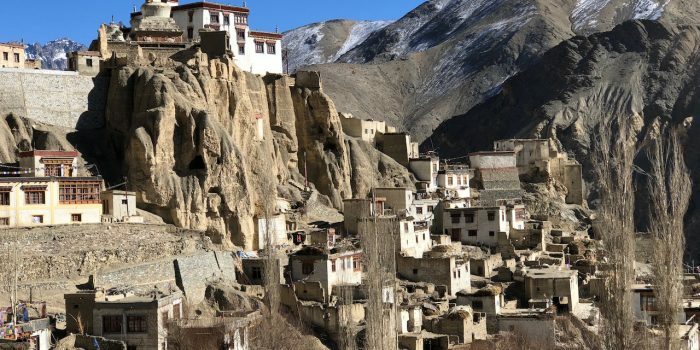 Many of our adventures start and finish in this city, so you might want to spend 1-2 days here to start to acclimatize before you head out into the Tibetan Plateau. 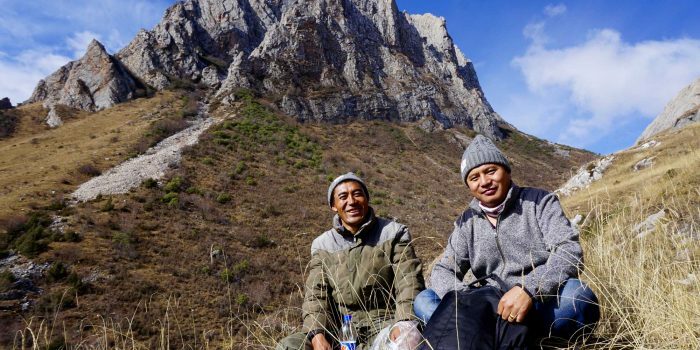 For those looking for adventure and to experience the authentic life of the Tibetan Plateau, this is your once-in-a-lifetime chance. 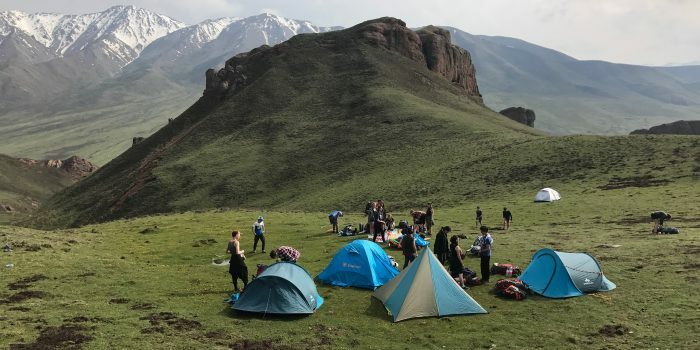 Sleep in a high altitude nomad tent and learn how to herd yaks, how to make yak butter and cheese, and how to cook yak momo (or dumplings). Best of all, if it is a clear night you will have a view of thousands of stars while out in nature, living on the open grasslands. 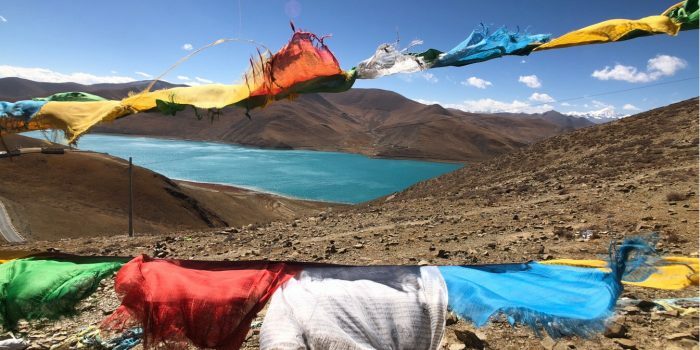 Yamdrok Lake (also known as Yamdrok Yumtso or in Tibetan: ཡར་འབྲོག་གཡུ་མཚོ་ and Chinese: 羊卓雍錯) is a freshwater lake in Tibet, it is one of the three largest sacred lakes in Tibet. It is over 72 km (45 mi) long. The lake is surrounded by many snow-capped mountains and is fed by numerous small streams. The lake has an outlet stream at its far western end and means turquoise in English due to its color. Gyantse is a small town in Tibet that packs a big punch. 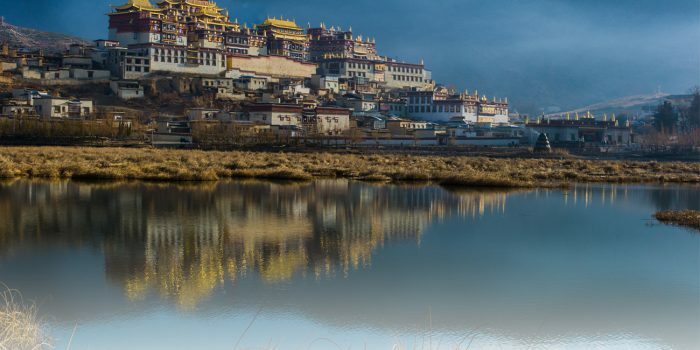 Located just a one day drive from Lhasa, you are definitely going to want to stop here for a glass of Masala Tea and a look at Tibet’s tallest Stupa, the Gyantse Kumbum. This is the second largest town in Tibet and is home to one of the greatest Gelugpa Monasteries in Tibet’s history, Tashilunpo Monastery. Come explore the world’s highest mountain with stunning views of Mount Everest. 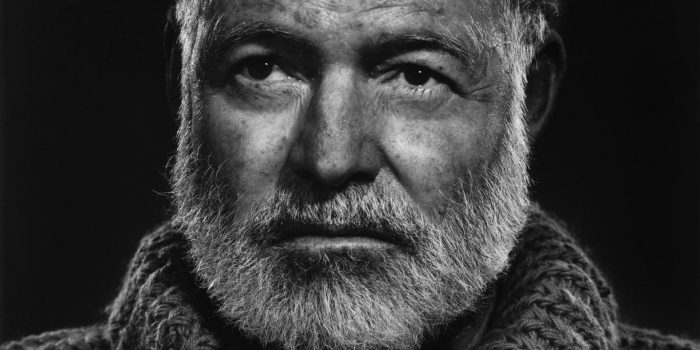 In this article we take a look at the first successful expedition to climb Everest in 1953. Taking the train in China can be a wonderful and exciting process and is a great way to see the countryside if you have the extra time to travel. But it can also be a chaotic and sometimes confusing process with millions of people traveling by train everyday in China. 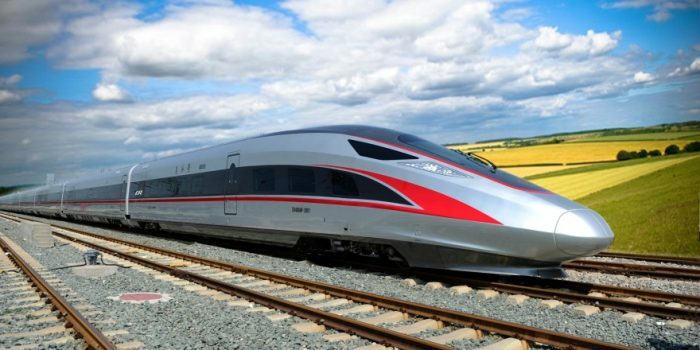 Find out everything you need to know before you book and board your train in China here. Okay. So you’ve tried the Sweet and Sour Chicken and the Kung Pao Chicken. And you have discovered that there is actually no such thing as an Egg Roll or a Fortune Cookie in Mainland China. Now you are ready for some serious local street food. Are you ready to graduate to see what real Chinese people eat? Then you must try malatang or in Mandarin: 麻辣烫. 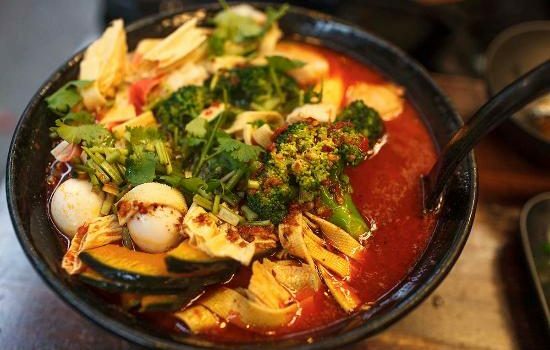 This hot and spicy soup is the perfect thing to warm you up on those chilly China winter days! As you travel to remote places it is super important to be prepared for emergencies, especially when you are far away from advanced medical care. 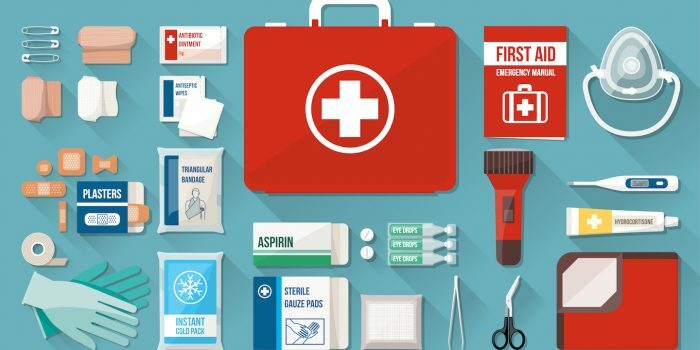 Here are a few simple things you can buy at most pharmacies and medical supply shops to prepare a First Aid Kit for your adventures. 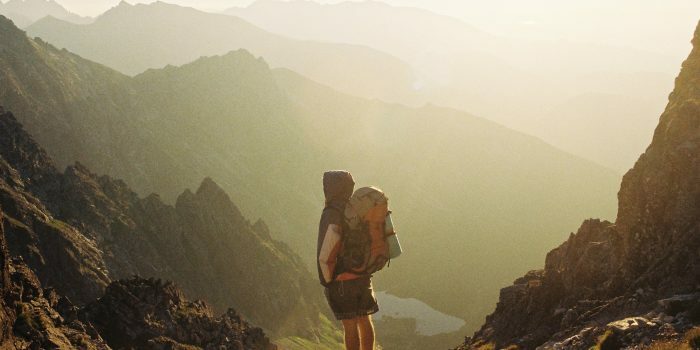 Whether you are a day hiker or you are out on a 30 day expedition in Alaska, you need to know the six most common injuries that happen out on the trail as you are backpacking, trekking, and climbing. 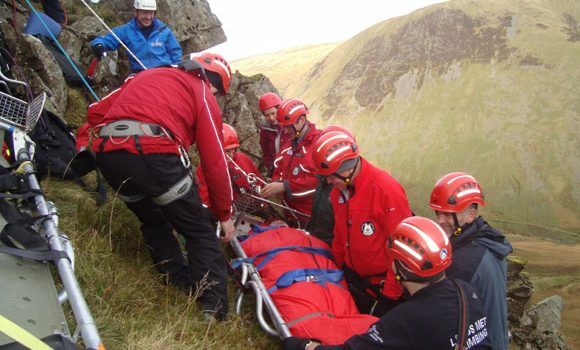 Just spending a few minutes reading this blog could give you the extra skills and knowledge you might need to save someone’s life. Team building through “experiential education” is an exciting way of discovering human potential and the larger world around us. In today’s modern, fast paced, urban society we often know more about video games and movies than they do about themselves or the world around them. Elevated Trips offers opportunities to get out of the busyness of the city and to build character and curiosity in the beauty of nature. We offer unique, fun events that present challenges and activities to participants to help them work together and to grow into their full potential. How can foreigners show honor to Tibetan culture through our actions and behaviors in a place that is not our home? 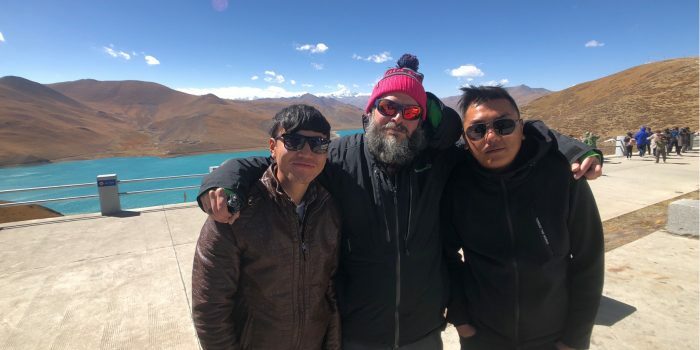 Tibetan culture has thousands of years of history and traditions and these have deeply influenced the culture of hospitality and every day actions. 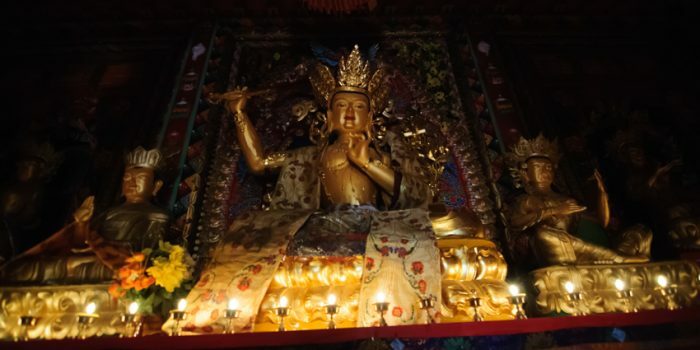 As a foreigner visiting the Tibetan Plateau it is important to know and understand some of the basic thinking behind this history so that we can be respectful guests when visiting a culture that is often as different to our own customs as it is mystical. 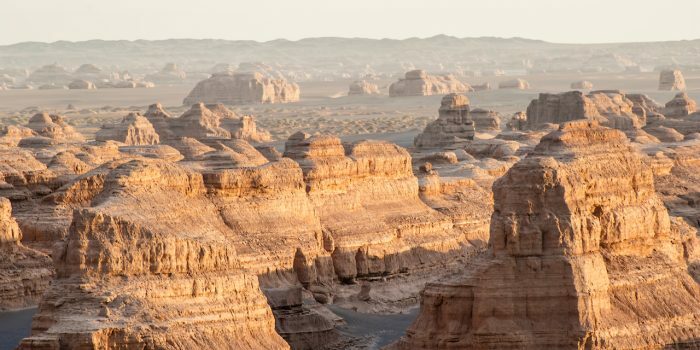 Located about 180-kilometer northwest of Dunhuang City, Yadan National Geological Park sits right on the edge of the Gobi Desert and occupies an area of about 398 square kilometers and has the largest landforms of its kind in all of western China. This park also has the nickname, “Devil City” because the wind howls here eerily through the open desert like the scream of a devil. 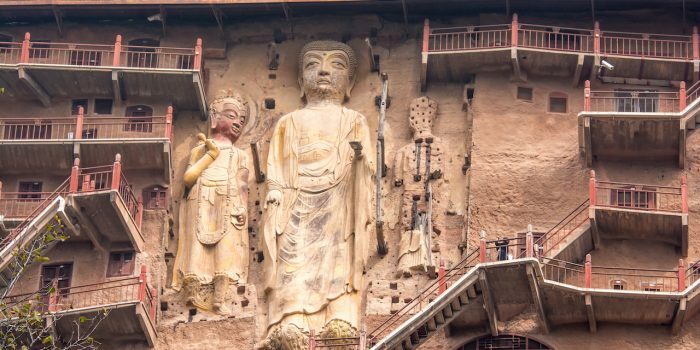 With a backdrop of the lush, green mountains just southeast of Tianshui town, the grottoes of Maiji Shan contain some of the most famous Buddhist rock carvings along the Silk Road. 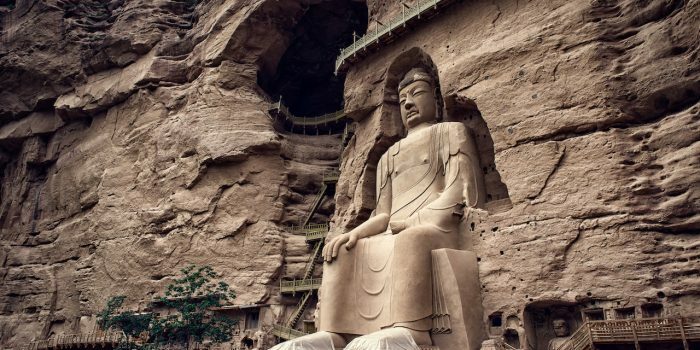 The steep cliff faces of Maiji Shan are scattered with 194 caves holding more than 7,800 sculptures carved principally during the Northern Wei and Zhou dynasties (AD 386–581). If you dare to ascend to the higher grottoes, you will need to cross a series of wooden planks and steps that ascend the outside of the cliff face to the top of a Buddha carved in the rock. When considering a team building event, you should know and be prepared to discuss the outcomes that you most value and the take-aways you desire your team to enjoy following the event. There are virtually hundreds of team challenges and activities available that provide outcomes ranging from trust building, to improving accountability practices, to defining roles, to boosting group morale. These are the terms and conditions for booking with Elevated Trips.